More than half of the U.S. have mandatory waiting periods in place. 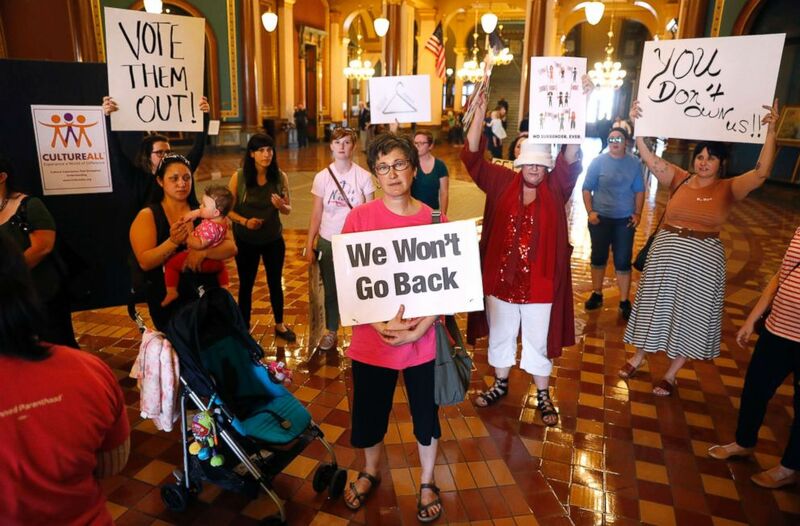 While Iowa is considering what could become the most restrictive abortion law in the country, the Hawkeye state won't be one of the states with the longest waiting periods for abortions. The Iowa Supreme Court on Friday struck down a law that required a 72-hour waiting period before obtaining an abortion. In the 92-page decision, the Iowa Supreme Court justice concluded that the three-day waiting period, which was passed in 2017 and then the subject of a lawsuit, "violates both the due process and equal protection clauses of the Iowa Constitution because its restrictions on women are not narrowly tailored to serve a compelling interest of the State." Specifically, the court cited research that showed the waiting period would effectively require two trips to an abortion provider, which "will result in emotional and financial costs" for the woman. "It will make it more difficult for some women to have medication abortions and force them into riskier and more invasive surgical abortions," the decision stated. The ruling came as the result of a lawsuit filed by Planned Parenthood of the Heartland challenging the 72-hour waiting period. The state's Republican governor, Kim Reynolds, who opposes abortion, said she was "disappointed" with the decision. "Often, women are in crisis when facing this decision, and it’s a decision that can impact them for the rest of their lives,” she said in a statement to ABC News. "I don’t think it is unreasonable to require 72 hours for someone to weigh their options and the important decision they are about to make." Reynolds' displeasure comes as little surprise. She also signed the controversial "heartbeat bill" that would ban abortions in Iowa after a fetal heartbeat is detected, which could come as early as six weeks into a pregnancy. A judge in Iowa has placed a temporary injunction on that law. It is currently being challenged in an ongoing lawsuit by Planned Parenthood and will not go into effect unless a decision that favors the law is reached. (Charlie Neibergall/AP) Protesters rally outside Iowa Gov. Kim Reynolds' formal office, May 4, 2018, at the Statehouse in Des Moines, Iowa. Chuck Hurley, vice president of the conservative group the Family Leader, told reporters that despite the court’s rejection of the 72-hour waiting period, conservatives would continue defending the 2018 fetal heartbeat law. “This makes the heartbeat case that’s in court right now, all the more important.... because Americans know, when a baby has a beating heart, she’s alive, she’s a person” he told The Des Moines Register. The rejection of the 72-hour waiting period in Iowa may have came from an understanding that the policy was "a ploy to make safe, legal abortion less accessible," according to Dawn Laguens, the executive vice president of Planned Parenthood Federation of America, which opposes any waiting periods for abortions. "Women deserve to access the health care they need without medically unnecessary roadblocks that only make it more difficult," Laguens said in the statement. Although Iowa rejected the three-day waiting period, there are five other states with such a policy -- and the majority of states have some form of waiting period in place, ranging from 18 hours to more than 72 hours. The Guttmacher Institute, a reproductive rights research group that was initially formed under Planned Parenthood but has operated separately for many years, tracks data on abortion laws. According to their latest data, four states -- Missouri, North Carolina, Oklahoma and Utah -- all require pregnant women to receive abortion counseling and wait at least 72 hours before having an abortion. The fifth state that falls into the category is South Dakota, though its law prohibits including weekends or state holidays in the waiting period, meaning a woman can wait longer than 72 hours to be able to have an abortion in some cases. Three states -- Alabama, Arkansas, and Tennessee -- have a 48-hour waiting period, 18 states have a 24-hour waiting period and one state -- Indiana -- has an 18 hour waiting period.